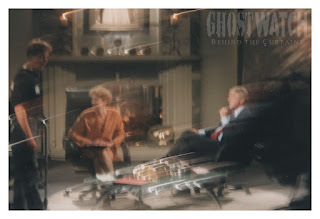 Ghostwatch: Behind the Curtains: Only at the BBC, loves! Only at the BBC, loves! So, news. But first, a recap. In late 2007, when I first met writer, Stephen Volk at The Watershed, Bristol, so intermittently timorous was I in handing over my treatment for then-pie-in-the-sky documentary project, first momentarily titled, Ghostwatch: Behind the Scenes, that I very nearly walked out of the building before I even got the chance. Though, to be fair, I was just about to miss the last train home. Then, a few seconds later, I did. A lot has happened since that spooky evening, a good deal of which can be found in the first book I ever wroted, which incidentally (... ahem) is still available from Lulu. The thankfully-short version forthwith comprises a five-year odyssey to help bring one of the most legendary TV productions rightly back into the spotlight, and out of its own hellish cupboard under the stairs (no, I'm not saying, 'Glory Hole'). 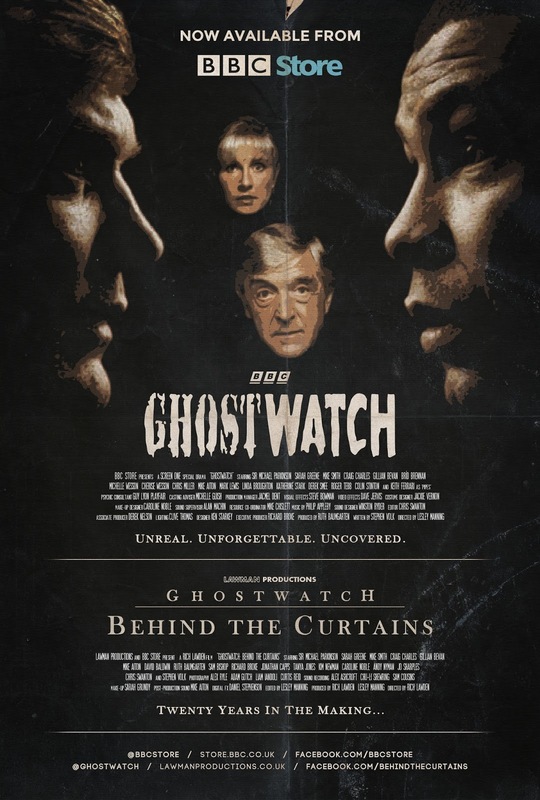 It is therefore with tremendous excitement that we can officially announce that both Ghostwatch and its feature-length, retrospective documentary, Ghostwatch: Behind the Curtains are now each available to download on BBC Store, headlining the brand-new Frightmares collection. For those just joining us, Behind the Curtains began life in 2007, following the aforementioned fateful encounter between the writer/creator of Ghostwatch, Stephen Volk and lifelong fan, Rich Lawden. 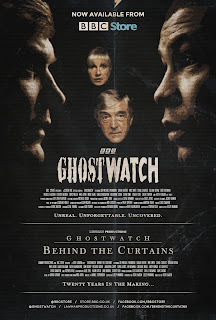 Soon after, Rich and Ghostwatch director, Lesley Manning partnered to form Lawman Productions in mind to making the idea a reality in time for the show's Twentieth Anniversary in 2012. The completed film was released to positive reviews, with ever-dwindling DVD copies now very close to fully selling out. But before even that, there was Ghostwatch, itself - a singular production that unravelled not only the power of Television, but arguably also our own collective desires as an audience. It was an instant-classic BBC special drama, carefully constructed to entertain, thrill, and inform, and to this day remains a mint condition pressing of British Horror, now globally renowned (and dreaded) for its effectiveness, quality and reputation. Following the original film's so-called 'banning' (despite being readily afforded a 12 Certificate by the BBFC in 2002), the BtC project was founded not only to serve as a much-needed touchstone for fans, but also a repository of information, covering inception to reception. 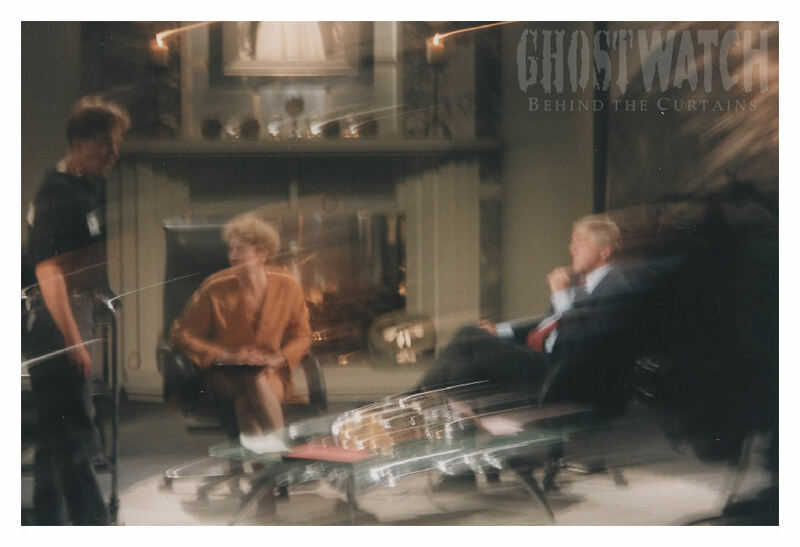 Along the way, fellow Ghostwatchers seemingly from all corners have keenly shared their stories, finds, and theories concerning the show - and also, experiences in overcoming their fears of revisiting the piece, many years later. During the past decade (yes, next year marks our tenth year online), there have been some memorable live events that have taken us all over the country, including the unforgettable Lowestoft, Brighton, Glamorgan, Scarborough, and LFCC. There have been two books. There's been an official remix of the original theme, and an unofficial rap by Pipes. There have been copious newspaper and magazine clippings, screen-grabs seen in Corrie, newly-unearthed trailers, prototype T-Shirts, cupcakes, podcasts, radio interviews, and now this - a truly exciting, and I think it is fair to say, historic development that after so many years of good will, vibes, and dedication from followers of both the show and project, can today best be summed up in just two words: Team Effort (... and I was the one who came up with the whole 'Team' idea - me). Speaking of which, genuine-gigantic-platinum-plated kudos as always to the doc's phenomenal cast, Sir Michael Parkinson and the wonderful Parkinson Productions, Sarah Greene, Craig Charles, Gillian Bevan, Mike Aiton, Ruth Baumgarten, Caroline Noble, Chris Swanton, Kim Newman, Andy Nyman, Cappsy, Jo & Tanya of TORDFC & G&T fame, plus David and Sam from The Electric Cinema who threw that fantastic screening in Birmingham, just a few years ago. An extra special mention of course to the BtC Holy Trinity of artists, Ian Evans, Arfon Jones and Daniel Stephenson, who each contributed some outstanding material to the film, which to put it mildly, will forever be appreciated. In fact, the level of support from so many fellow Pipes-Phobes has been truly great, and it deserves to be said, incomparably generous - particularly our friends and followers on both Facebook and Twitter - notably, ghostwatch.info founder, general lege' and all-round-good-guy, Stephen Freestone - and not forgetting, especially that from two truly irreplaceable friends and gentlemen, the late Richard Broke (Executive Producer) and lead actor, Mike Smith, who both remain sorely missed. Suffice it to say, a download for the doc is something that has been on the to-do list for a while. We began receiving requests even before the initial DVD release in 2013, so naturally as a result, are thrilled to finally be able to do so. A big shout-out must also go to the ever-expanding BBC Store platform itself, and its dedicated team for developing the fantastic new Frightmares collection, which also includes such cult classics as, Count Dracula (1977), The Nightmare Man (1981), The Mad Death (1983), The Blue Boy (1995), and the recent, three-part BBC drama, Remember Me (2014) starring Michael Palin. So, what's next on the horizon for Ghostwatch? Well, all things being equal, and given that 2017 marks the film's 25th Anniversary, without providing any direct visual descriptions just yet, let's just say that more is still to come. Least of all, National Séance 2016! 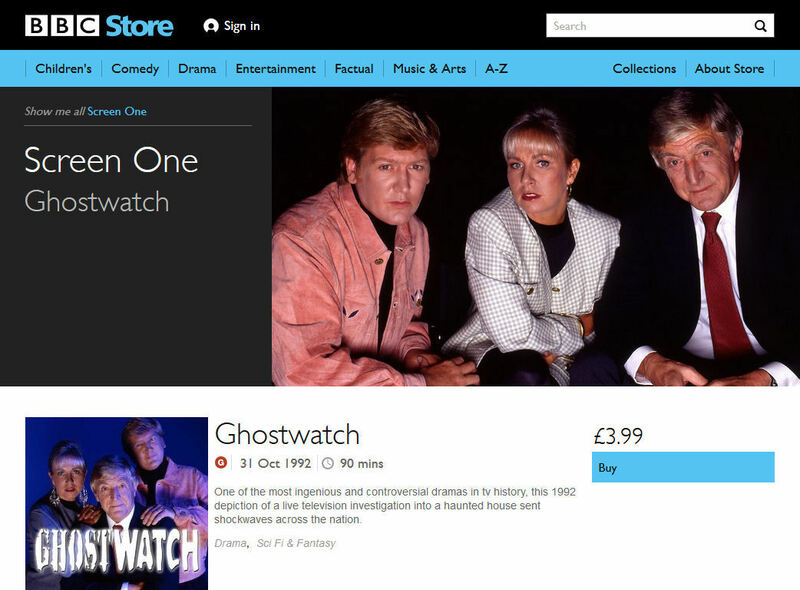 And what better way to enjoy your spanking-new digital copy of Ghostwatch, than to play it along with us at 21:25 on Monday October 31st. For more on how to take part, check out our past articles, and remember - irrefutable photo evidence of your themed event, or it didn't happen! Until then, enjoy a comfy, sleep-filled night, Ghostwatchers. You've earned it. And again, my thanks.